In the PS4 game Kingdom Hearts 3 you can unlock a total of 46 trophies. In this Trophy Guide we show you all the trophies and their tasks. 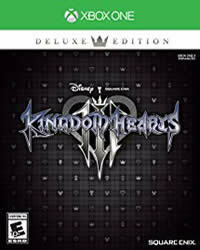 More Guides and News about Kingdom Hearts 3 you will find on our overview page. Automatic story trophy, cannot be missed. You unlock them after beating the endboss. You can not find all the collectibles? Here we have a guide to all locations. Head to the Galaxy "Misty Stream" to find the Schwarzgeist , more specifically in the middle of the green tornado. The Schwarzgeist is a big spaceship that you have to defeat with your gummi ship. To do that you need a damn good ship, so go to the Gummi Shop and buy blueprints for better ships. To complete the Synthesis section, you need to synthesize every unique item available in the Moogle Shop at least one time (including Ultima weapon). First you need the Ultimae recipe, next you need unique materials called Orichalcum+. Here we show you all details. Automatic Story Trophy. You unlock them after playing the tutorial. Automatic Story Trophy. You unlock them after completing the 1st world. Automatic Story Trophy. You unlock them after completing the 2nd world. Automatic Story Trophy. You unlock them after completing the 3rd world. Automatic Story Trophy. You unlock them after completing the 4th world. Automatic Story Trophy. You unlock them after completing the 6th world. Automatic Story Trophy. You unlock them after completing the 7th world. Automatic Story Trophy. You unlock them after completing the 8th world. All in all you have to find 9 constellations in the game, here we show you all the locations.